Bif Bang Pow! and Entertainment Earth have announced their latest SDCC exclusive – an 8″ figure of Mike Tyson based on this fall’s new series ‘Mike Tyson’s Mysteries’. This is your first chance to own the former-boxer-turned-mystery-solver’s action figure. 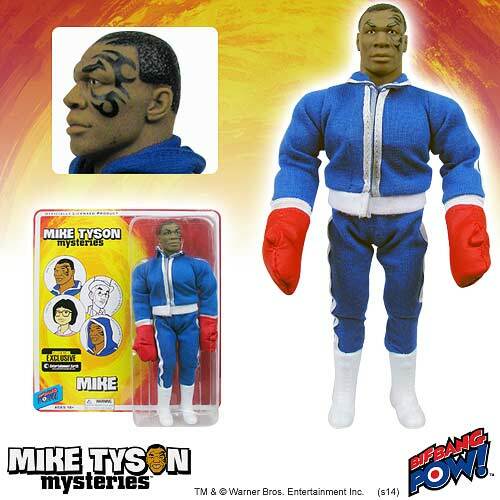 The figure features a fully articulated body and Tyson is wearing a blue and white cloth sweatsuit with boots and SDCC exclusive red boxing gloves. The figure also features Mike Tyson’s signature face tattoo. Priced at $24.99, you’ll be able to pick this up at the show at Entertainment Earth’s booth – #2343. You can also pre-order now at Entertainment Earth for delivery after the show wraps up. You can find the pre-order page here.